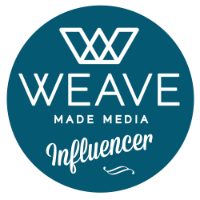 *Disclosure: I received two VIP tickets to attend this event. The opinions expressed here, however, are my own. 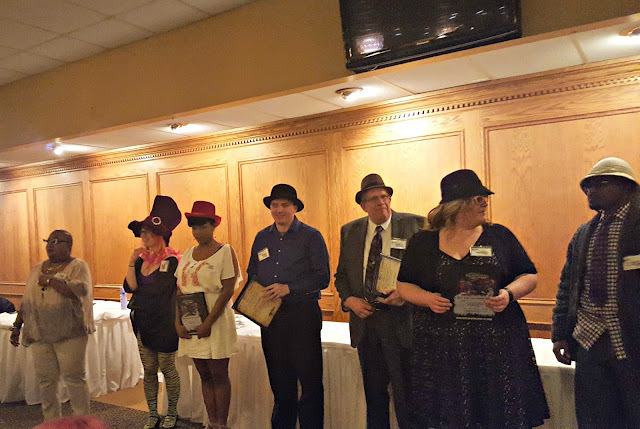 Although I have been to a murder-mystery party at a friend's house before, I had never been to an "official" murder-mystery dinner, so I was excited to try out The Murder-Mystery Company's show in Eastpointe, MI this past weekend. 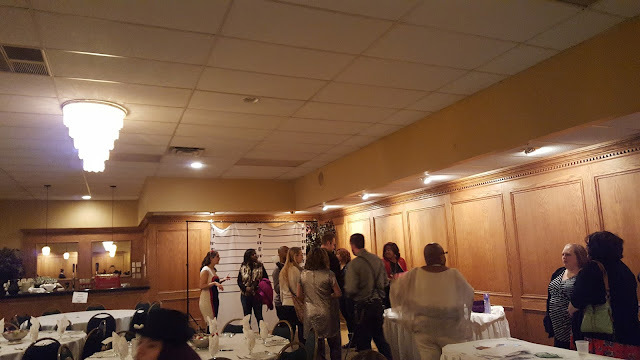 We arrived at Eastpointe Manor around 6:30 - technically, the line starts at 6:30 for VIP ticket holders, which we were, and 6:40 for non-VIP. When we arrived, however, there was already a line, so make sure to arrive early if you attend a show. After you check in, all guests get their photos taken - you can see the backdrop here in the middle of the above picture. These pictures are available for purchase for $20 after the show, or if you upgrade to VIP tickets (cost of your ticket, plus $19), you get a free photo, as well as preferred seating - aka seating closer to the action. 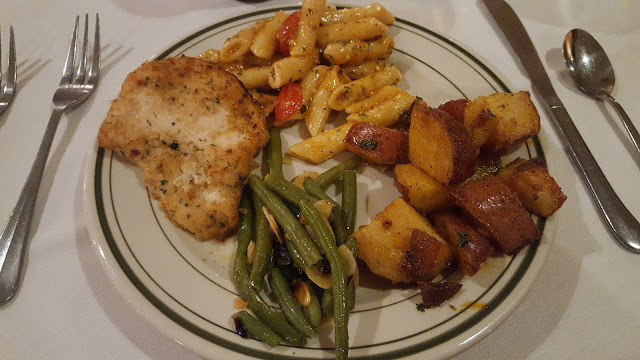 After everyone is seated, the dinner buffet starts - when you purchase your ticket, there will be an option online to select what dinner you like (either chicken or pasta primavera, though I believe it differs per show), so I was expecting more of a plated/waitservice dinner. However, the buffet format worked fine too - the chicken and potatoes were especially tasty, so I went back for seconds. There's also a cash bar, with soft drinks for $1 too, and pitchers of water at each table. After dinner, the murder-mystery portion of the evening began. 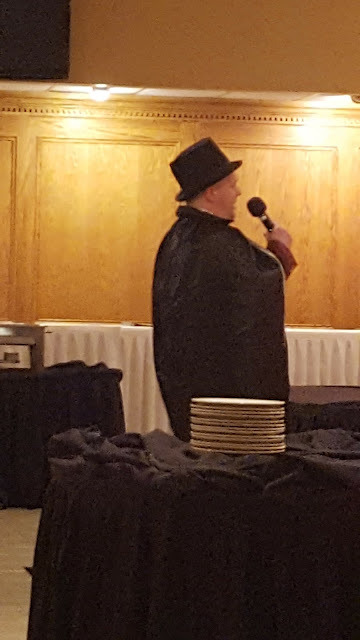 There were about 4 to 6 actual "actors," and then a few people from the audience tables were chosen to be characters as well - one girl at our table was Penny Lane, an 8-year-old who knew the magician who eventually got "murdered." 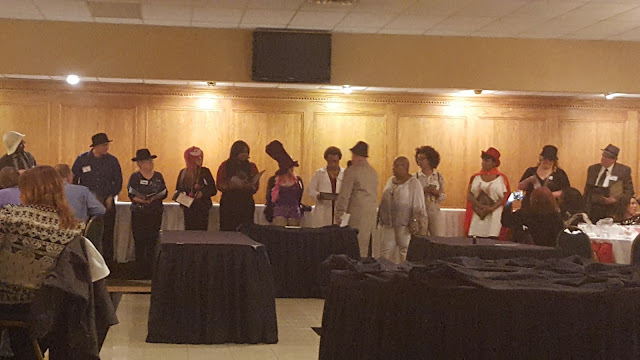 Penny received a binder full of information, and we and the other guests were able to bribe her (using fake money distributed among the tables) for information to solve the crime in between the acting "scenes." Overall, I had a lot of fun attending "Of Sound Mind and Dead Body," presented by The Murder Mystery Co., as did my mom. I will say that it would probably be more fun to go with a large group, though, so you know the others at your table - each table seats ten people, but we didn't know the other eight people at our table, though we all worked together to come up with our guess as to who the killer was. 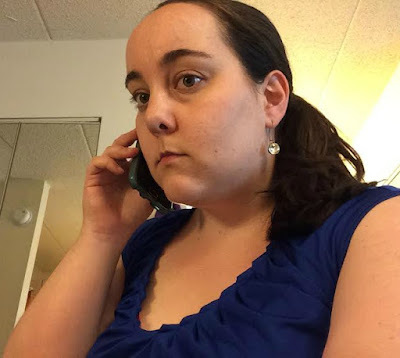 Tickets for the Eastpointe, MI show are $60, but if you sign up for The Murder Mystery Co's email list, you get a code for half off your ticket. Check Groupon for tickets before you go, too - at the time of this writing, the Eastpointe location is doing a deal for $26 for one (general admission) ticket, or $51 for two tickets. A couple at our table mentioned they bought the Groupon deal, as well. If you'd like to upgrade to a VIP ticket, it's $19, and that includes preferred seating - otherwise, you can purchase your photo at the end for an additional $20. Your ticket fee covers dinner and the show, but not tipping, and it's highly encouraged to leave a tip for waitstaff. The Murder-Mystery Co. has shows all over the U.S., and they also do a show in Livonia at Burton Manor - tickets are $90 for those shows. I'll be attending an upcoming Livonia event soon, as well. 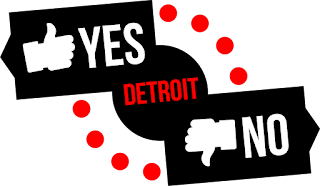 Other Michigan shows include Grand Rapids, Lansing, and Ann Arbor. Each show has a different theme - the show we attended this time was "Of Sound Mind and Dead Body," but the June 16, 2017 show for Livonia is entitled "Best Laid Plans. 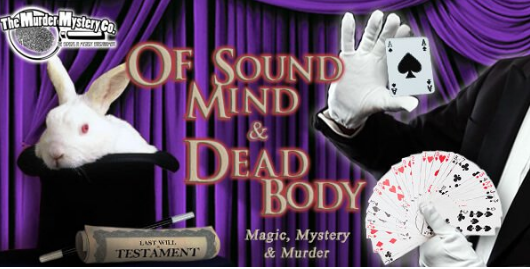 "Of Sound Mind and Dead Body" will be performed again at the Eastpointe location, on June 23. It's encouraged to dress up in costume like the show's theme! 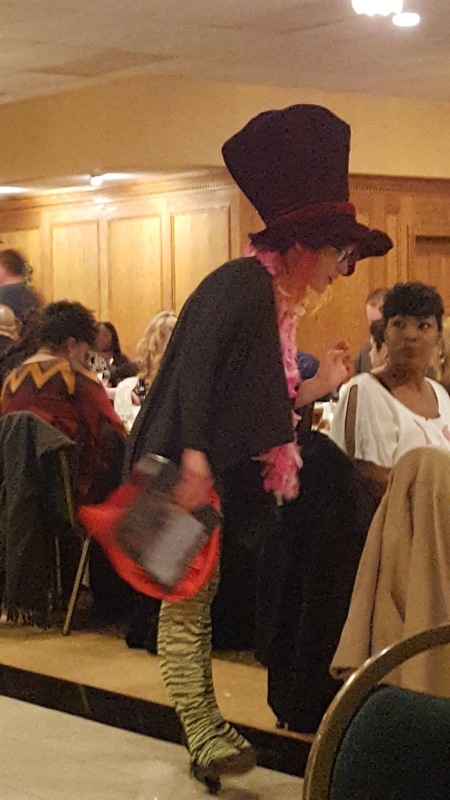 Ours was a magician theme, so a lot of people wore cloaks and top hats; I wore a black dress and brought a vintage purse that I have. Have you ever been to a murder-mystery party or dinner? If so, did you enjoy it? One of my lucky winners will win a pair of tickets to the June 16, 2017 show at Burton Manor in Livonia! The theme for that show is "Best Laid Plans." 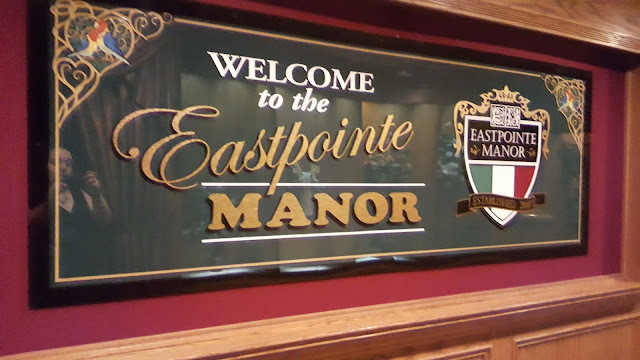 If Eastpointe is more convenient for you, you can instead opt for two tickets to the June 23 show at Eastpointe Manor. Enter via the widget below. Giveaway will end on Tuesday, April 18th, at 11:59pm EST, and winner will be chosen the next day and have 24 hours to respond, or an alternate winner will be chosen. Must live within driving distance to Livonia or Eastpointe, MI to enter this giveaway.